We had an idea, why not see how our crisps taste with natural herbs? We quite literally raided the garden, sprinkled rosemary and a hint of thyme over our crisps. They were so good, we had to do the proper thing and share. I have been so busy over the last 8 weeks that my poor family have been having to cope without cooked meals most days. So, now that things are getting back to "normal" I have been in the kitchen a bit more. Tonight, I wanted to catch up on my #FoodLab fun... while also preparing one of my family&apos;s favourite dishes - Mac&apos;n&apos;Cheese. I had some extra bacon in the freezer that needed to be dealt with before it got freezer-burn, so I decided to go back to one of my earliest recipes - lots of Vitamin Bacon, onion, garlic, lots of cheese and breadcrumb topping... scrummy. But, instead of using toasted breadcrumbs and mixed herbs... I used finely pulverised Rosemary & Thyme and Paprika Proper Crisps. An inspired idea, according to my fellow diners, as it made for a really nice crisp topping that cracked apart as I dished it up. These crisps imparted a wonderful herby note to the topping, which meant I didn&apos;t need to worry about adding any extra herbs in - the one step in every meal I almost always misjudge. I was very grateful that the Proper Crisps folks had done the hard yards on finding the right balance for me. 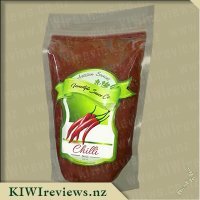 The crisps themselves are wonderful too, great as a snack, amazing with every dip I tried them with - from a fruity sweet mustard pickle dip to a spicy chilli dip made with sour cream and NZ BBQ Chilli Sauce. 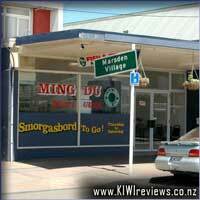 They also went very well - surprisingly so - in a Kiwi classic "Chippie buttie" sandwich with Marmite and cheese! 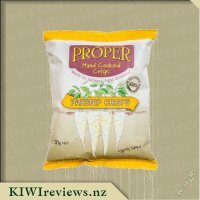 Overall, a great New Zealand classic snack in the making... though the price does put them a little out of the "regular foodstuffs" range and firmly in the "special eats" category. I was also really impressed at how each bag carries the name of the potatoes used, because I can now use that information to help guide my buying choices when I want to know what spuds handle frying well... for making my own hashbrowns. Thanks PC crew! 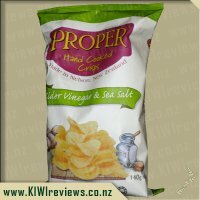 Proper hand made crisps are exactly what the name of the product is, which is a good start as it could be a bit awkward if they weren&apos;t. They are made down in Nelson by hand, and are rather very good. Rosemary and Thyme was the first flavour I had a crack at with these crisps and Iw wasn&apos;t too sure what I was expecting, my memory of flavours aren&apos;t that great at the best of times. So when I shoved some of this great crisps into my gob I was like, oh Rosemary and Thyme, and new this was the correct way it is supposed to taste. It is a classic combo of flavour and it works well with these crisps, being hand made and only containg potato&apos;s, sunflower oil and the flavour from rosemary and thyme it could have easily been done wrong and I am thinking out of all four flavours this would have been the hardest to perfect at a guess. I love the crunch, and could easily see this crisp being used as some sort of crumb that would work well on a lamb dish. Maybe even as a type of garnish to put over some lamb chops, it would work well and would have people guessing to exactly what you have done. If you want to try some hand made crisps, then get yourself some of these. 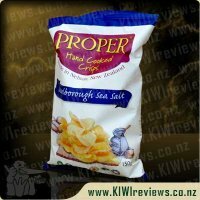 Check out their website for stockists, hopefully this will grow soon, as it is a shame not being able to find these everywhere, as more people need to know what proper hand cooked crisps taste like and stop eating all the processed junk that is out there. I wasn&apos;t so keen on this flavour. But I am not really a huge herb fan. My partner really enjoyed them. They were very flavourful. I like how the chips were thin and but they don&apos;t crumble when putting my hands in the pack to eat or dishing them out to share. I Liked that the chips didn&apos;t leave an oily feeling on my fingers when eating them. 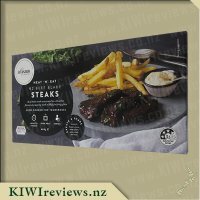 The packaging was nice and the picture on the packet made it easy when looking at all the packs together to know that that was the rosemary and thyme pack.They were easy to open and plenty of chips in each pack. The wording on the package was easy to read and a readable size. They are made with no artificial colours of flavours so I was happy to give them to my son. After not enjoying them so much and having about half a pack left, I crushed them up, I was making a potato bake type dish with mashed potatoes and veggies and mixed these through and I could taste the flavour of the herbs come through and that was much more appealing for me than eating them straight. 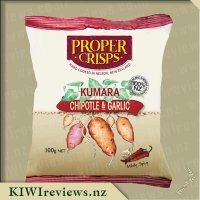 I would recommend these chips to people who are fans of herbs or looking for a crunchy herb flavour to mix into potato bake. At the food show this flavour was my least favourite of the bunch from Proper Crisps. Which was surprising as I love rosemary seasoned roast potatoes. Thinking that I might become more accustomed to them with a larger portion, I decided to give them a crack again. Straight from opening the bag the smell is unmistakable and is such a great savoury aroma. After a handful or so, I was still quite not sold on the flavour. I don&apos;t know why, it&apos;s not a bad flavour, it&apos;s either due to not being used to this sort of flavouring on a crisp or to me it doesn&apos;t suit being a chip. Not wanting to waste 3/4 of a bag of crisps it was now the turn to come up with some ideas on what I could use these for. My first idea was with a potato bake to go with dinner the next night. Making the potato bake as per normal and then sprinkling crushed crisps together with the cheese on the top sounded like the ideal way. Well I wasn&apos;t let down with this option. The flavours certainly enhanced the potato bake and both Mrs Possum and master 7 loved the crunchy texture that the crisps added to the crust of the potato bake. This was a winner and may make a come back by popular request. I love myself a chip sandwich and also having some left over roast lamb in the fridge added this to the mix this turned out perfectly. The added flavour of the chips to an ordinary lamb sandwich was brilliant. A good snack to chow down on for a weekend lunch. If I was hungry for a chip, I don&apos;t think I&apos;d chose this flavour but as an additive to food it may come in handy simply for its great texture. As much as I enjoyed the previous flavours, I&apos;m afraid that this one was quite a big disappointment, for me, I don&apos;t like the taste of rosemary, for me, when I think of rosemary, I only think of those little purple flowers I used to tickle people with. The chips also had quite a large amount of salt, so as began to start taking chips from near the bottom of the bag, all the excess salt began to get into my mouth, so I enjoyed the crisps better when I was taking them from the top of the bag. 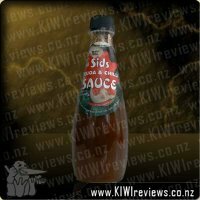 I am not blaming the company for this, as it is highly likely that some people like this kind of flavour more that others, so I am only stating the fact that his flavour and my taste buds don&apos;t react well. 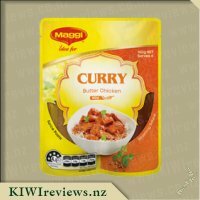 Perhaps this issue could be solved by using these in other meals, and when I looked at some of the other reviews on this product I noticed that others have tried the same concept. The price is great, it is somewhere around the same price as most other crisps, only this type has a vital difference: these were cooked by hand, not put in the hands of machines to be given a big load of additives, preservatives and artificial flavourings! 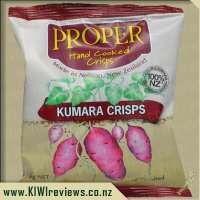 The packaging is good, it displays a good-looking picture of the crisps, which holds appeal to the eyes of those who love this kind of flavour. It also displays important info and a friendly-sounding description, all of which earn this product some points. So, the official verdict is that these chips don&apos;t do so well on the topic of flavour, but in other aspects they rank as high as the other flavours! We opened this packet to try for a tea time treat. They smelt lovely and filled the room with a herb scent straight away. Miss Muffin dug straight in and so did we. She didn&apos;t enjoy the flavour at all, I found it a bit strange and Mr Muffin described them as distinctive. We decided they were not unpleasant but unique. I think being a different flavour to the standard threw us a little. I decided that these need using up in a meal of some form. The dinner I decided upon was crisp coated chicken tenders. We already had the tenders so this made life easy. I crushed up the crisps and mixed them with about 1/3 panko crumbs. Dipped in egg this, crumb stuck nicely to the chicken. I cooked them on a baking tray in the oven. The temperature was 200°C and they took about 20 minutes in our oven. The crumb was lovely, it had a nice crunch and gave the chicken tenders a very nice flavour. The chicken tasted like a good roast. It was a good way to use this flavour of crisp. I wouldn&apos;t buy this flavour again as it just wasn&apos;t our thing. If you like this kind of taste, go for it. The crisps are good quality and made of great quality potatoes. I like potato chips/crisps that have herbs on them so long as they are done right. Some are bursting with flavour, and some have too strong a flavour of either oil or one herb is too strong a flavour. Gave these a try, just as they were. The first thing that struck me was that they do have a nice rosemary and thyme smell to them, however I didn&apos;t really enjoy the overall taste of the crisps and found them to be a bit too oily for my liking. My husband and I didn&apos;t really enjoy these chips and so had plenty of chips left for experimenting. I was making a cheesy pasta bake for dinner with my dad and stepmother and I had an idea to add a bit of crunch and flavour to the meal. Put the pasta in a baking dish, the sauce on top and then scrunched up a whole heap of chips and sprinkled it atop the sauce, cheese on top and then baked it. Once we dug into the meal there were these lovely little bursts of herbs with each bite, a couple of times it did taste a little oily but not enough to detract from the overall taste. Reheated it wasn&apos;t as nice, but I would do it again. Whilst I wouldn&apos;t buy these chips to eat as they are, I would use them if I was making a pasta bake again. When I opened this bag of chips, I honestly thought I smelt a delicious chicken roast flavour. I was really surprised to find this was a vegetarian version. Of course, that makes it fabulous because I have friends who love a good roast vegetable but don&apos;t do meat at all. The herb flavour was a big hit with me, and was probably my second favourite of the lot. The first thing I decided to try with this flavour was to crush up the chips and mix the crumbs into some raw chicken pieces. The chicken allowed the crisp crumbs to stick. I then fried the chicken up, allowing it to crust. I added some stirfry vegetables and some Udon noodles as well. This made a great dinner meal for the kids and I. My kids yummed up dinner and I thought it tasted a lot like chicken stuffing. The next thing I tried was to make a Yorkshire pudding with some of these chips crumbed into the mix. The Yorkshire puddings didn&apos;t puff up as I hoped. The mixture in truth came out more like a scone. 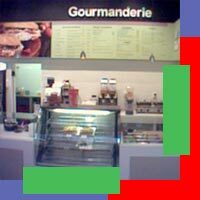 But the herbal flavour was very pleasant and the scone-things made for a yummy lunch today. Overall, a great flavour and this would go into my trolley again in future. This packet of crisps was such a beautiful product I was really impressed. It was the first packet I opened as the flavour was just so appealing. It is so great that all the contain is rosemary and thyme salt, and oil as I honestly think that there is no need to add msg to food, and these crisps certainly prove that as they have so much natural flavour it is brilliant. After eating a few of the crisps we decided to make home made chicken bites. We crushed up the crisp and added some breadcrumbs to make it stretch and coated pieces of chicken breast in the mix and cooked them in a little bit of oil. We then served the bites with salad and wraps. The little bites were delicious and far better than any take away chicken nugget or frozen nugget I have ever tried. The kids tucked in to theirs and soon decided that they wanted more. The bites tasted like a really well seasoned and stuffed chicken, so as you were biting into the wrap you would almost think you had roast chicken and stuffing in there rather than chicken nuggets. It was really nice having the nice crunch of the potato crisps too, to give them that extra texture, it is something I have never tried before as I usually use cornflakes and crumbs but this was so much better. Having tried the Smoked Paprika variety from Proper Crisps yesterday, today my husband chose Rosemary and Thyme for us to share with Miss 3.5 and Miss 5. I must admit that this was the flavour that most appealed to me from the list of flavours. I expected Miss 5 to complain about them because they had "grass bits on them" as she usually does with any thing that she can see the herbs on. She didn&apos;t, in fact she devoured her whole bowl without a word. Her younger sister inhaled her share and then wanted the rest of mine so it was safe to say it was her favourite flavour. The smell and taste of the chips reminded me of chicken stuffing without the stale breadcrumbs which always turned me off stuffing. 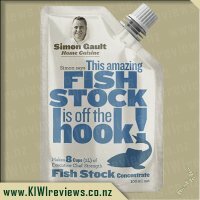 I was sure it contained chicken stock but was surprised to see it contained only potatoes, sunflower oil, salt, rosemary and thyme. I just looked on the packet of another popular brand of chips and counted 15 ingredients (herbs and spices was only counted as one). After discovering this I know which one I would prefer. Proper Crisps every time. Well this bag of chips had me at the ingredient list! We (well really me as the main lunchbox packer and food preparer in the house) are on a health food kick to eat natural food products so a pack of flavoured crisps that contains only potatoes, sunflower oil, salt, rosemary and thyme is a great start. Little Miss Two and I cracked this bag open as soon as we got home and I must confess they were so good I had to resist devouring the whole bag at once and somewhat reluctantly left a few chips for the other Little Misses to try when they got home from school. 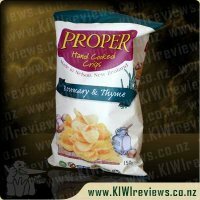 There was nothing not to love about this bag of Proper Rosemary and Thyme Crisps. Although you might want to check your teeth after eating (or as eating if you are with someone you are trying to impress) as those fresh chopped herbs have a way of sticking to your teeth! I absolutely loved the flavour which was spot on. The texture of the chips was a little oily but they are fried in oil and need oil to hold the herbs to the crisp so that was okay. I didn&apos;t really get that horrible "I&apos;ve eaten too much oil" feeling from eating these crisps which is possibly because o the taste of the herbs. The bag of crisps is 150 grams and the nutrition label says that a serving size is 50 grams so you get three servings from this bag. A total of 34 grams of fat per 100 grams. That does mean that you would get 49 grams of fat if you ate the whole bag yourself (but more on that in my Smoked Paprika review!). 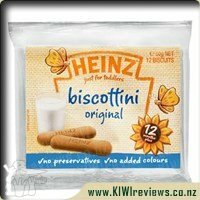 Overall this was my favourite flavour and I would definitely buy these again though would look out for them on special. 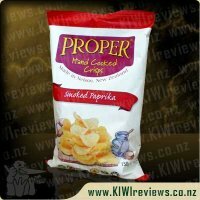 They are definitely Proper Crisps made as they should be! 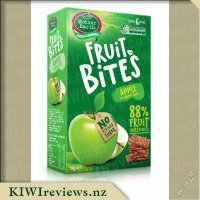 Apple Fruit Bites - For kids who love fruit! Bite-sized pieces made from apple puree and juice, with crispy rice bubbles and very little else.